Is your classroom too noisy? 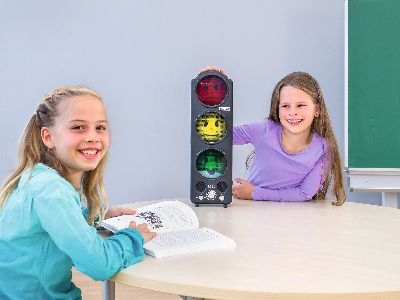 This noise level meter, regulates acceptable noise levels within your classroom, using the traffic light system. As noise level increases, lights change from green to yellow and finally red with or without sound. As the teacher, you will now ensure that noises become visible for your learners. This will enable your learner to be more focused and get their work done in a quicker manner. And you will keep your sanity with low noise levels in class. Table mount and/or wall brackets included. Battery operated! Using rechargeable batteries (not included) does not only save our planet but ensures a continuous operation of 6 hours.